Sorry, Death Mod 1:1 clone by HCigar has been discontinued. 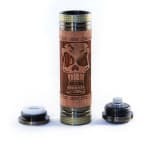 This 1:1 clone of the Death Mod by Hcigar is made of a high quality stainless steel with wooden coating, with a brass button and bottom ring. HCigar is one of the most well-known clone manufacturers out there. Compared to most most that fit different battery sizes by having removable rings, the Death Mod is only compatible with 18650 batteries. The mod itself features a carved wooden appearance with a skull emblem carved in to it. The button is spring loaded, and the mod itself utilizes 510 threading and would be compatible with any EGO adapter if you wish to use a different clearomizer. Mods like the Death mod are perfect for either sub-ohm tanks like the Aspire Atlantis or the Kangertech Subtank, or with RDAs that will allow you to build your own coils. This mod uses removable batteries (sold seperately) and requires an external battery charger (also sold seperately).